By Costa Maragos Posted: April 5, 2017 2:00 p.m.
Dr. Thomas Hadjistavropoulos appreciates the challenges facing the health care system in delivering care to Canada’s aging population. Hadjistavropoulos is a Professor of Psychology, and Director of the Centre on Aging and Health at the University of Regina. The Centre brings together investigators focused on gerontological research in the areas of Aboriginal health and aging, musculoskeletal health and mobility, pain in old age and personhood and resilience in senior care. To access the publication please visit here. 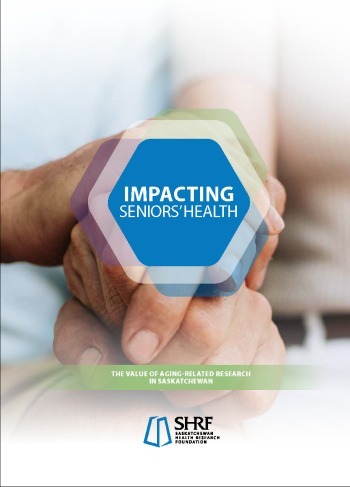 The Centre’s contributions to improving health care for Saskatchewan’s seniors, are among the highlights in a publication produced by the Saskatchewan Health Research Foundation (SHRF). 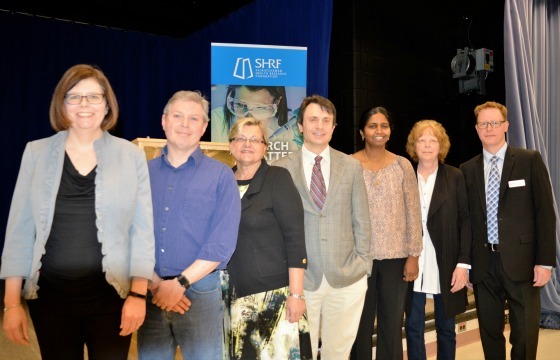 The publication, Impacting Seniors’ Health – The Value of Aging-Related Research in Saskatchewan was released at an event held at the University of Regina on April 5. The 32-page publication is intended to create awareness of aging-related health research and demonstrate the impact of Saskatchewan Health Research Foundation’s investments in the research community. The publication points to numerous success stories, where research funding from the Foundation is assisting in the quality of life for seniors. Hadjistavropoulos is one of those researchers who addressed the crowd at the publication’s unveiling. “The proportion of Canadians over 65 years of age is expected to surpass 20 per cent by 2030 and to reach 30 per cent by 2056. It is questionable whether, Canada’s health care system will be able to handle the increased demands that will be caused by health problems that often accompany aging,” says Hadjistavropoulos. The publication features one University of Regina initiative (the Centre on Aging and Health) and one University of Saskatchewan initiative (a research group with the College of Kinesiology). In addition to these initiatives, the works of individual researchers from the two institutions are also featured. Dr. Abigail Wickson-Griffiths from the Faculty of Nursing; Dr. Bonnie Jeffery, from the Faculty of Social Work in the Prince Albert Campus, Dr. Thomas Hadjistavropoulos from the Faculty of Arts, and Dr. John Barden, Dr. Darren Candow, Dr. Rebecca Genoe, Dr. David Malloy and Dr. Shanthi Johnson all from the Faculty of Kinesiology and Health Studies and Dr. Carrie Bourassa, Health Sciences North Research Institute. “This publication is intended to create awareness of essential and innovative aging-related health research and ultimately to demonstrate the impact SHRF-funded research has on the people of Saskatchewan,” says Patrick Odnokon, CEO of the Saskatchewan Health Research Foundation. The Saskatchewan Health Research Foundation is the provincial agency that invests in high quality health research through research grants and award opportunities, and promotes the impact the research has on local and global health.